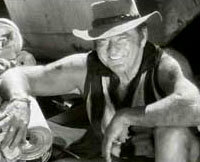 Rod Taylor plays Daddy-O in his return to Australian cinema, four decades after leaving his native Sydney for Hollywood. This was director Stephan Elliott's first effort since his campy cult film, "The Adventures of Priscilla, Queen of the Desert," and viewers seem to rate "Woop Woop" as either hilarious or vile. Of course, it's both vile AND hilarious -- and that's the point. "People will laugh and they will be offended," director Elliott has said. "Ultimately, as upset as the politcally-corrected may stand, it's very tongue-in-cheek. A silly, silly movie." Elliott believes the performance grew out of the fact that Taylor, a genuine knockabout Aussie, has lived and worked in America for so long that he has been forced to suppress his natural self for 40 years. "The true base of what he was has been simmering away under the surface -- like boiling to get out -- and this role came along and he just explodes on screen," Elliott said. "I usually tell the actors I am working with to turn it up a bit. Rod is the first actor I have worked with where I had to keep telling him to turn it down a bit. Once it was unleashed the energy coming out of the man was just terrifying. I was there going 'down Rod, down, cool it baby.'" 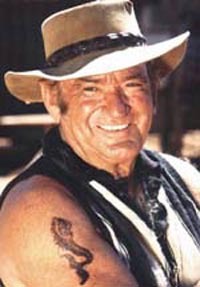 Elliott sought out Taylor for the role of Daddy-O, the patriarch of warped Woop Woop, based on his fond memories of "The Time Machine" and "Picture Show Man." When his name came up, I said he is such an American now, I wonder if he could do it. I rang his agent and asked is he still working [and] do you think he could pull off the accent. He said, "Why don't you just go round to his house and knock on the door." So I did, he threw it open and said, "G'day...how the f--- are you? Come in and have a glass of red wine." I said to him immediately, "You have the job." It was that quick. To make it even more perfect, his comic timing is so spot-on. I hope this is a good film for him as it was with [Terence Stamp, in "Priscilla"], an amazing resurrection. This shows ... that he is an amazing actor. Rod accepted the role in a snap. "I fell off the sofa laughing when I read the script," he said. "It was the most outrageous comedy I had ever read and certainly the most outrageous comedy I'd ever acted in. I usually do nice sophisticated comedies with Jane Fonda and people like that -- gentlemanly roles. But here I am in Australia playing this bloody dinosaur with tattoos. It is just fantastic." In a stroke of inspired casting, Rod Taylor looms larger than life as the lewd Daddy-O, and basically steals the film. His character is vile and vulgar, yet Taylor manages to inject a dose of charm that is hard to ignore. The scene in the bar when he tap dances on electric sparking feet is quite sensational. Especially notable is Rod Taylor's version of the blustery autocrat, Daddy-O. ... Taylor seems to have gone through an acting rebirth since his days as the square-jawed lover boy from the '60s action movies. There are many funny moments in "Woop Woop," and two very good performances. One is from ... a nearly unrecognizable Rod Taylor, a former Hollywood leading man who returns to his native Australia [as the] cruel, iron-fisted ruler of Woop Woop. HE is a sensational actor. Charisma, balls, strength, power, emotion and great comedic timing. Originally titled "The Big Red," the film was shown as a work-in-progress at Cannes. "Woop Woop" had plenty of detractors, but what most reviews of this movie agreed upon is that the point of "Woop Woop" is not the plot, it's the bizarre characters. Speaking of plot -- here's the outline: "Welcome to Woop Woop" is the story of Teddy (Johnathon Schaech), a streetwise hood who hawks exotic birds in New York City. In an alleyway shoot-out, Teddy's birds are released, and as they swoop over the city, New Yorkers find a solution that perhaps the good people of Bodega Bay should have considered in "The Birds." Teddy flees to Australia and ends up shackled in the outback to a "girl who cain't say no," Angie (Susie Porter). He tentatively meets and then bonds with the weird folk of Woop Woop, which is run by Angie's father, Daddy-O. Daddy-O's rules? All money is pooled for the common good; nobody leaves, and only Rodgers and Hammerstein show tunes are allowed (which, by the way, makes for a wonderful soundtrack -- my favorite pick-me-up!). Rod has magnificent moments in this film: His joyous dance upon the bar (to "Shall We Dance," of course), his speech as he lays out the rules, and another as he relates the history of Woop Woop after his authority is challenged by Teddy. This is a great actor having a wonderful time. Author Michael Winkler has brought us an essential guide to this misunderstood movie in his book, "Fahfangoolah! : The Despised and Indispensable Welcome to Woop Woop," published in 2016. Winkler writes that Woop Woop has "everything a cult classic needs: top-notch casting, quotable dialogue, memorable music, crazy costumes, black humour and ... batshit crazy cameos." Rod Taylor, of course, heads the "top-notch casting" part. 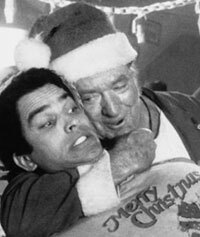 The chapter titled "Rod Taylor and Johnathon Schaech" opens with this statement: "The great roaring engine that propels Welcome to Woop Woop is Daddy-O." Rod also provides quotable dialogue: "As Daddy-O, [Taylor's] accent is not just broad Australian but wonderfully, broad 1950s Australia. The voice is right, the face is fantastic, and he even contributed his own catchphrase -- 'Fahfangoolah!'" Winkler does a great job of capturing why "Woop Woop" is so misunderstood but yet so essential in depicting a disappearing slice of Australian life. The book also maps out the triumphs and challenges of the production, as well as the forces that shaped the final product. In regard to Rod, the book contains praise for his performance and offers details about key scenes -- especially his electrifying tap-dance on the bar. A pivotal scene that would have explained why the residents of Woop Woop wear such a weird assortment of clothing. It was inspired by director Stephan Elliott's recollection of the all the "inappropriate crap" that he saw piled up following a call to aid the residents of a flooded town -- wedding dresses, designer gowns, platform shoes, etc. The deleted scene has Daddy-O driving up in a big truck and screaming, "The rain's come down in Marble Bar," and then he empties a bunch of castoff clothing from flood relief. A sub-plot that gives Daddy-O further ammunition, so to speak, for shooting Midget as he tries to escape Woop Woop. The book offers a glimmer of hope that such scenes -- and Elliott's original vision -- may surface one day. Elliott says he'd love to raise the money and put all the footage back together. In the meantime, read all about it! 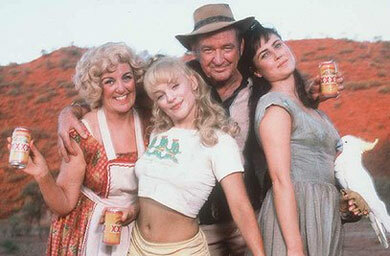 Welcome To Woop Woop was filmed on location near Alice Springs. Surrounded by towering red cliffs, the mythological town of Woop Woop was created from the ground up with scrap metal and piles of junk in one of cinema's most imaginative and surreal designs. "The most exciting moment for me, having created the town with the art department, was watching the actors walk into it," production designer Owen Paterson reflects. 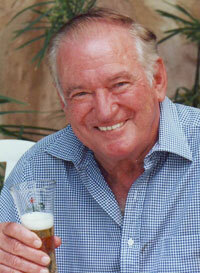 "I tried to create the pub, for example, knowing Rod Taylor was going to play Daddy-O. I pictured his face and had a photograph of him, and had a sense that the pub needed to feel well established, almost coming out of the ground." Director of photography Mike Molloy said, "Rod Taylor's face was so wonderful in close up." Molloy also described an action scene: "We did a truck chase ... which is massive. It is hugely fun and completely over the top. We had a 41-ton truck with Susie Porter and Rod Taylor trying to stop it with an axe. The whole thing looked insane and dangerous, but we actually did it stationary using effects. That is what is so fantastic about the art of film."